65 High St, CR3 5UF.Tel: 01883 346600. Shop Smart offer: 10% off all std prices. You've tried the Cowboys, now try the Indians! 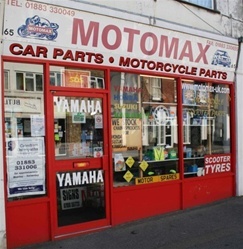 Car & Motorbike parts & accessories for a wide range, especially classic bikes. Motomax has been a specialist supplier of motorcycle parts and accessories for over 17 years. We can cut keys if you have the key number for various older patterns. Call or e mail us today with your requirement and let us take the nuisance out of getting the parts you need.